Tissue spins in a beaker at the end of the cleansing process that removes all of the cells. 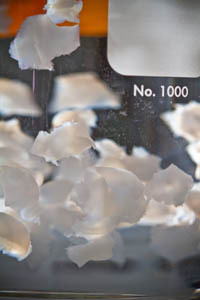 The process retains the tissue’s structural proteins, a key component of the hydrogel. 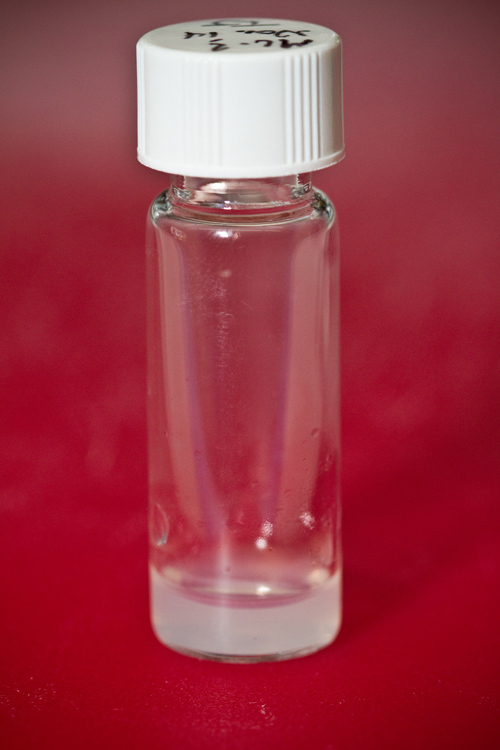 Tissue is liquefied into a fluid that can be easily injected into the heart. Once it hits body temperature, the liquid turns into a semi-solid, porous gel that forms a scaffold to encourage cells to repopulate areas of the heart damaged by heart attack. What’s more, the researchers’ experiments show that the gel also can be injected through a catheter, a method that is minimally invasive and does not require surgery or general anesthesia. New, unpublished work by her research team suggests that the gel can improve heart function in pigs with cardiac damage, which brings this potential therapy one step closer to humans, said Christman. Christman has an equity interest in Ventrix, Inc., a company that may potentially benefit from the research results, and also serves on the company’s Scientific Advisory Board. The terms of this arrangement have been reviewed and approved by the University of California, San Diego in accordance with its conflict of interest policies. The study’s co-authors include Jennifer Singelyn, Priya Sundaramurthy, Todd Johnson, Pamela Schup-Magoffin, Diane Hu, Denver Faulk, Jean Wang, and Kristine M. Mayle in the Department of Bioengineering; Kendra Bartels, Anthony N. DeMaria, and Nabil Dib of the UC San Diego School of Medicine; and Michael Salvatore and Adam M. Kinsey of Ventrix, Inc. The research was funded in part by the National Institutes of Health Director’s New Innovator Award Program (part of the NIH Roadmap for Medical Research), the Wallace H. Coulter Foundation, and the National Science Foundation. Porcine connective tissue is stripped of heart muscle cells through a cleansing process, freeze-dried and milled into powder form, and then liquefied into a fluid that can be easily injected into the heart to repair damage caused by heart attack. There are an estimated 785,000 new heart attack cases in the United States each year but no established treatment for repairing the resulting damage to heart tissue.